(Oregon Coast) – Come spring break, it seems so many are trying to get away from it all that they've brought all of it with them to the Oregon coast. Oh, the throngs. The busy-bodied throngs. (Above: Otter Rock and the Devil's Punchbowl area). There are some interesting ways to get away from that, however. Three beachy spots along the Oregon coast provide plenty of pleasures while hiding out from the rest of the vacationing world. 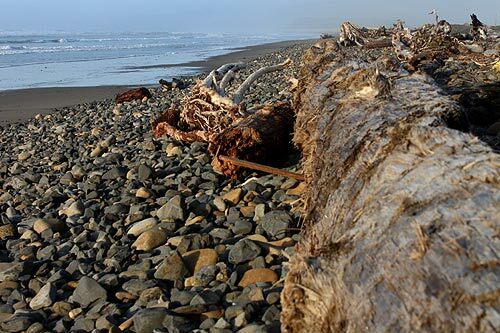 One truly hidden gem is on the north Oregon coast, at the Bayocean Spit. 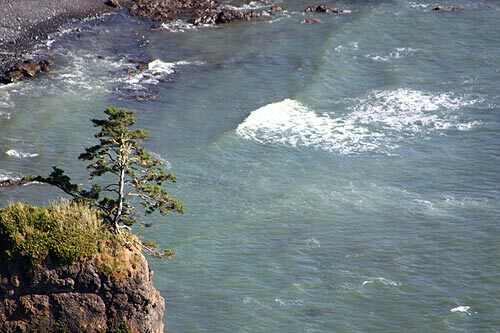 Where Tillamook Bay ends and Cape Meares – the village, not the promontory – begins, you'll find this truly unpopulated place. It's all about nine miles west of Tillamook, at the end of Bayocean Road, which takes you to the northern end of the Three Capes Loop. 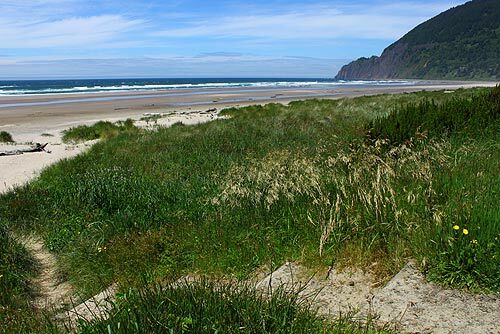 But just before that turnoff, there's the parking lot for these miles of soft sand and the Bayocean Spit, as well as the turnoff to the village of Cape Meares. Besides being a wondrously wild and untamed spot, the Bayocean Spit is even more surprisingly once the home of a bustling resort. On these pristine, seemingly endless sands, you're walking on the remains of a tiny town called Bayocean, started a little over 100 years ago. It once boasted a hotel, natatorium and numerous other attractions, along with homes and several miles of roads. Due to various economic issues, the Great Depression, transportation problems and bad businesses deals, the resort never completely took flight and lay in ruins by the 30's. Several huge storms washed chunks of it away early on, and by the 80's what little was left was bulldozed by the government. The tiny town gathering place at Cape Meares is all that's left of that town. It's also interesting to note that when walking the gravelly beach here, you're at about what was once Third Street: meaning there was a Second and First Street. Those are beneath the waves directly in front of you. 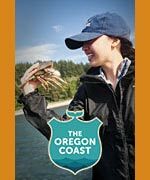 See here for places to stay in the Cape Meares, Bayocean area: also see the listings for Oregon Beach Vacations and Beachcombers NW there. Halfway between Newport and Depoe Bay, you have the almost-village of Otter Rock. Set on a tiny headland that also boasts the raging waters of the Devil's Punchbowl, it's really like a tiny neighborhood in the middle of an Oregon coast nowhere. If you stay here, (and there's really mostly just vacation rentals for that) you may find the paths down to the sandy beach on the northern side of Otter Rock, set in the middle of a thick forested canopy. Or take the long stairway down to the surfers paradise on the southern face, looking towards Newport. 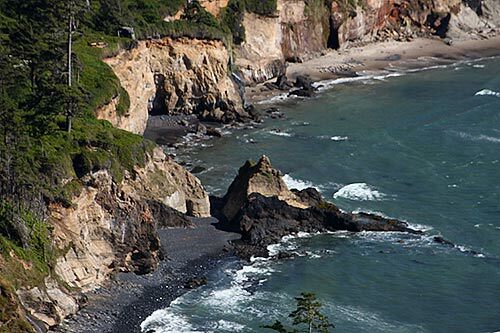 Melissa Dierkhoff, manager of Inn at Otter Crest, said the beach access there and walking to the Devil's Punchbowl is just the beginning of puny but plentiful Otter Rock. Cruise around Otter Crest Loop to find copious hidden viewpoints, and at least one outrageously cool hidden cliff viewpoint that lurks below a gravel pullout. 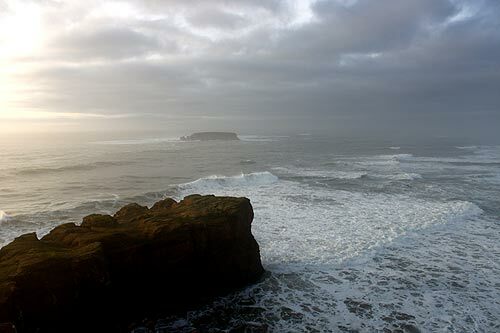 Or lose yourself in the jaw-dropping views of 500-foot-high Cape Foulweather. An Insider's Tip: look just to the left of the staircase on the headland's southern side and spot a tiny, untouchable cove below. There sits a ghost forest stump: a remnant of a forest some 4,000 years old. 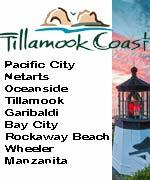 See here for places to stay in the Otter Rock area; also see the listings for Oregon Beach Vacations and Beachcombers NW there. 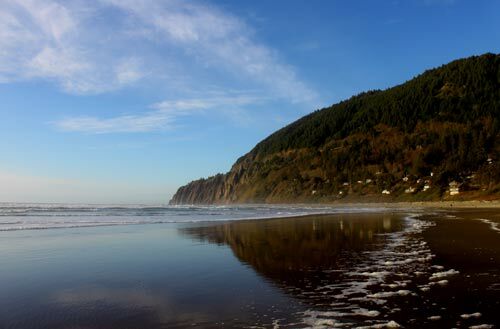 Manzanita is a growing hotspot on the Oregon coast, but it's still the most hidden of the popular beach destinations, making it a unique dose of the laidback but still convenience-filled civilization. Brian Hines, owner of Mananita's San Dune Inn, touted the lack of commercialism, such as no fast food joints and all locally-owned cafes. He noted the pet friendly aspects of the town and its seven miles of beaches as well. Hit the southern end of this north Oregon coast wonder, closer to Nehalem Bay State Park, to really find yourself alone. 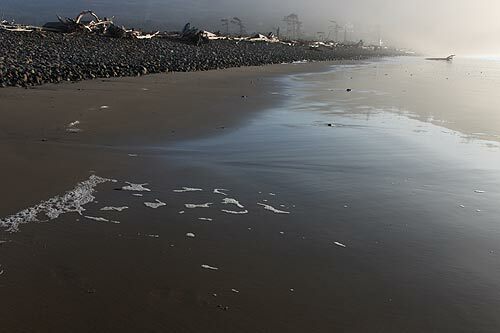 Or better yet, hike the several miles of the Nehalem Bay Spit to encounter seals and all kinds of birds. Hit the northern end of the beach for wild rock structures and other objects embedded in the surf. But most of all, make sure you take in the vast horizon of the Neahkahnie Overlooks, just above Manzanita. Here, on a clear day, you really can see forever. Find Manzanita places to stay. More on these beach spots below. 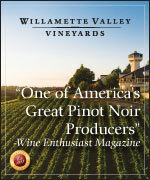 Click on the photos for maps, virtual tours.